How Does PYRO-ENERGEN Work by Applying Static Electricity? 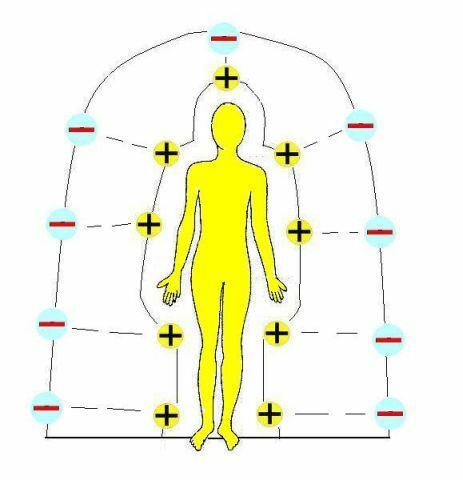 As seen in the figure, the paranormal wave, illustrated as positive (+), surrounds the body, penetrates it, and creates virus. The PYRO-ENERGEN does electrification outside the body (it does not induce nor penetrate the body), illustrated as negative electron (-), which discharge the paranormal wave, positive (+). As we know in physics, positive and negative electricity makes friction, discharging the virus-creating wave instantly. The PYRO-ENERGEN technology is not in the world dictionaries. Any existing medical or scientific words simply cannot explain the theory of it. Scientists and medical scholars are trying to find the root and origin of diseases such as Parkinson’s disease and cancers. But if you can’t find its origins, then how can you possibly find the remedy and cure for these dreadful diseases? Doctors are just trying to apply available drugs and modern medical machines. Most of these machines and drugs penetrate the body. Anything that passes or penetrates the body produce joule heat. Anything that produces joule heat in the body have side effects whether it is serious, mild or unnoticeable at all. Therefore, most machines claiming that it does not produce any side effects are not noticeable by patients. Static electricity is an electric field that occurs when rubbing things. PYRO-ENERGEN is a machine that produces similar electric field without the need of rubbing. PYRO-ENERGEN is a machine that does electrification to our body but there’s no static electricity that passes, penetrates and consumed by the body. Thus, no joule heat occurs and no side effects at all. What does electrification do? That’s the unknown technology and unknown to scientists of the world. Only the inventor of PYRO-ENERGEN knows it. He knows the origin of these incurable diseases so he knew how to eradicate them. Many did not believe when Albert Einstein discovered the law of relativity. It is just the as Mr. Takano’s situation right now. When he discovered the origin of viruses and mysterious diseases over forty years ago, many refused to believe him. He invented PYRO-ENERGEN to eradicate the world maladies but only countable numbers of people believed. The origin of viruses is from a wave similar to the ionospheric wave in the sky. He cannot tell you what it is exactly and it’s a trade secret at moment. Electrostatic energy produced by PYRO-ENERGEN counteracts the paranormal wave energy that creates virus in the body.